San Francisco 49ers quarterbacks Colin Kaepernick, left, and Blaine Gabbert stand on the sideline during the second half of an NFL preseason football game against the Green Bay Packers on Friday, Aug. 26, 2016, in Santa Clara, Calif. Green Bay won 21-10. THERE'S NOT a damn thing new about not standing up for the national anthem. If you grew up black in the United States, there was always someone around who would refuse to rise when that song was played or when asked to say the Pledge of Allegiance. Those who remained firmly in their seats were the righteous folks. Conscientious objectors, if you will. As a kid, I respected them, because they had a hard time reconciling America's lofty ideals with how it treated people of African descent. Some of these were men who had gone to various wars and returned home only to be disrespected because of skin color. Some were women denied decent employment options only to be violated by males in the houses they cleaned. Many were young men who had been arrested on trumped-up charges or harassed by police. Others were upset about being denied a decent education. They had parents who were forced to sit in the back of the bus and relegated to "colored" bathrooms. There was a time when I counted myself among them, absolutely refusing to recite the Pledge of Allegiance. Even as a teenager, those words rang hollow to me. Pledge allegiance to a flag? It seemed like a form of mass indoctrinization, and I declined to recite it. I didn't make a big deal about it. In the Catholic schools I attended, I found it easier to go with the program than to draw unnecessary attention to myself. I always stood along with my classmates. But I wouldn't put my hand to my chest. Nor would I recite the pledge, because as far as I could see, "liberty and justice for all" was not a reality. So the fact that a 28-year-old professional football player chose to take a stand by refusing to rise along with his teammates as "The Star-Spangled Banner" is played doesn't faze me one bit. 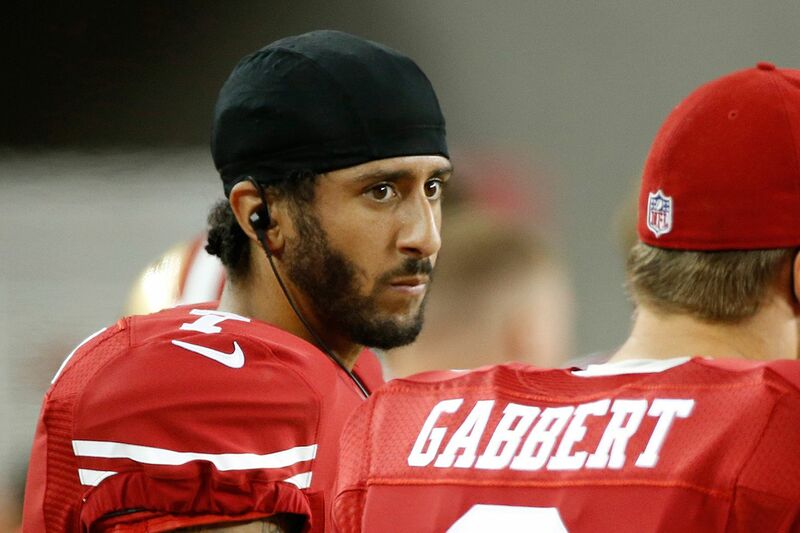 In fact, I'm proud of San Francisco 49er Colin Kaepernick. I like to sing, so I stand and sing the anthem. Still, I support him 100 percent. Kaepernick, who's biracial, is the latest in a long tradition of people of color in sports to refuse to stand. His refusal, and the harsh reaction, remind me of what Muhammad Ali and Jackie Robinson experienced as proud black athletes who refused to give in despite incredible pushback. Robinson even wrote in his 1972 autobiography, I Never Had It Made, "I cannot stand and sing the anthem. I cannot salute the flag; I know that I am a black man in a white world." What I want to know is, why don't more NFL players follow Kaepernick's lead? I guarantee you that many of them agree with his position but are scared to follow suit. "I am not going to stand up to show pride in a flag for a country that oppresses black people and people of color," he told NFL Media in an interview after the game. "To me, this is bigger than football, and it would be selfish on my part to look the other way. There are bodies in the street and people getting paid leave and getting away with murder." Key put slavery and land of the free in the same verse of the poem, which later was set to music. Is it any wonder that some racially conscious folks can't buy into this song and have always been troubled by it? "It's interesting that people are acting so shocked by this," James Peterson, director of Africana studies at Lehigh University, told me Wednesday. "But in reality, this is a fairly conventional way that African Americans historically have chosen to exercise the most American of all things, which is the right to free speech and the right to protest." Chad Dion Lassiter, cofounder of Black Men at Penn, also refuses to stand for the national anthem at sporting events. "Instead I sit with head bowed reflecting on those who protect our freedoms and praying for the others who get dissed when they get back by their government," said Lassiter, a 76ers season-ticket holder who attends most of the home games. "I respect vets and those who salute, because that is their right, and I have my right." His parents would advise his Philly schoolteachers that he would sit out patriotic rituals such as the Pledge of Allegiance. "My teachers had to respect the stance of my parents," Lassiter added. "It was nothing against the American flag. It was nothing against the national anthem. It was just that our family is not about symbols and idol worship where it's about indoctrination. And that's what we're really into in our country." The way I see it, a lot of folks are more worked up over Kaepernick's position than over the police brutality and institutional racism that he's protesting. It's a whole lot of misdirected anger. "They're mad at him," Lassiter said. "But they're not mad at what he's talking about - black and brown bodies dying in the street, some police officers getting off with killing black and brown bodies with impunity. They're mad that he doesn't stand for the national anthem." From where I sit, it makes no sense.